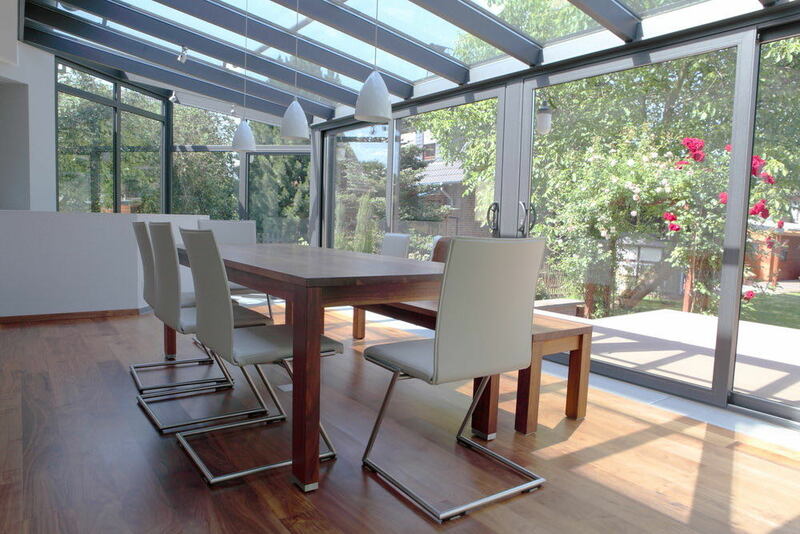 Create a dynamic, contemporary and sun-filled room with a modern glazed extension. 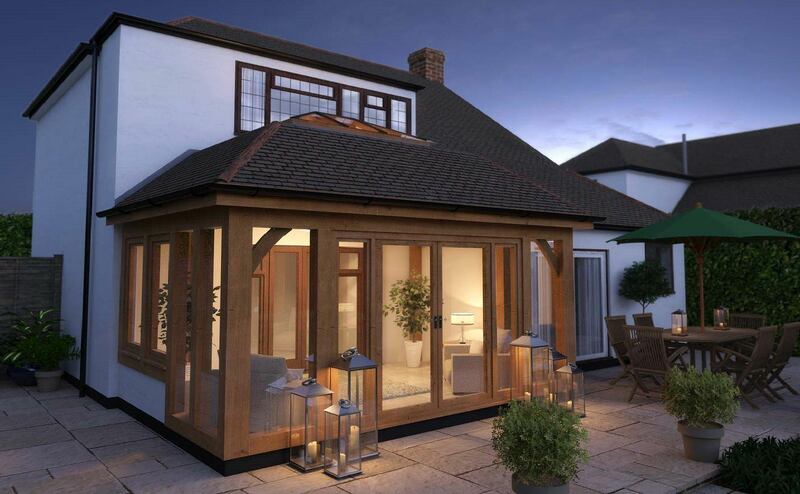 Maximise the potential of your extended space with a stylish, modern glazed extension. 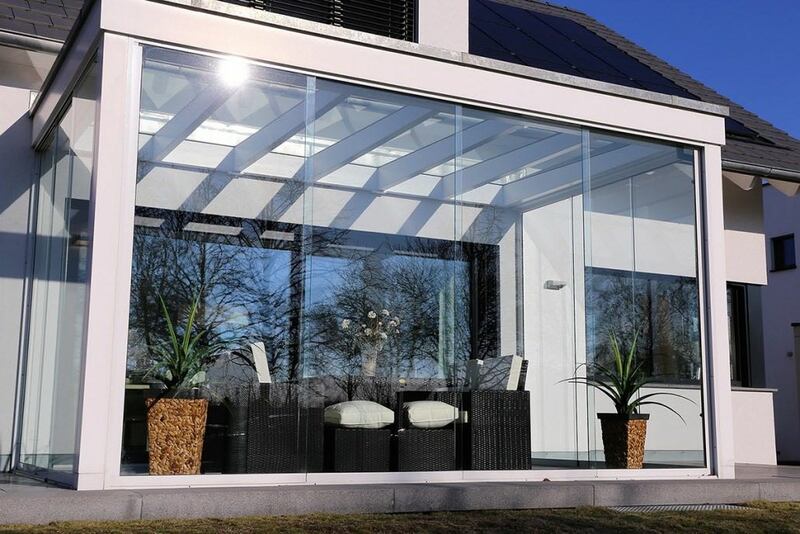 Glass extensions can bring glamour to any home and be used to connect two or more solid parts of a property. They look great attached to urban terraces or semi-detached homes and are a great solution for adding more space whilst also giving that ‘wow’ factor. 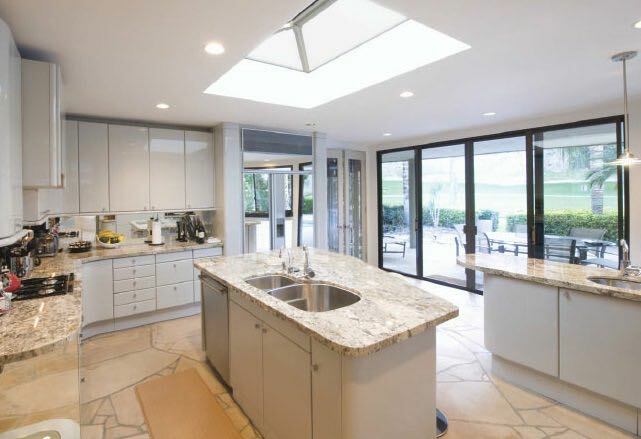 Just imagine an entire glazed wall, coupled with a stylish set of bi-folding doors. If you’re looking to create something rather fantastic then visually, nothing will beat a modern glazed extension. Will a Modern Glass Extension Suit My Home? A modern glazed extension will sit well on all types of home. They make a handsome companion for brick buildings and can provide a wonderful, dramatic contrast to a period property. Traditional homes can hugely benefit from modern glass spaces whilst still maintaining their kerbside period charm. A framed glass extension can work really well with existing sections of glazing in a 1970’s style home. Properties will instantly be transformed into contemporary, light-filled homes. Whether you are after a matching addition to a modern home, or a contrasting extension for a traditional property, a glazed extension is the perfect way to add more light and space. 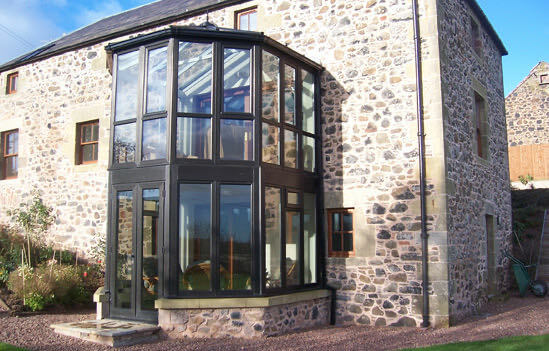 A modern glazed extension is sometimes favoured by English Heritage for use on Listed Buildings. This is because they make a clear distinction between old and new. A single storey glass extension can instantly transform a small home, adding lots of light and giving the illusion of more space. 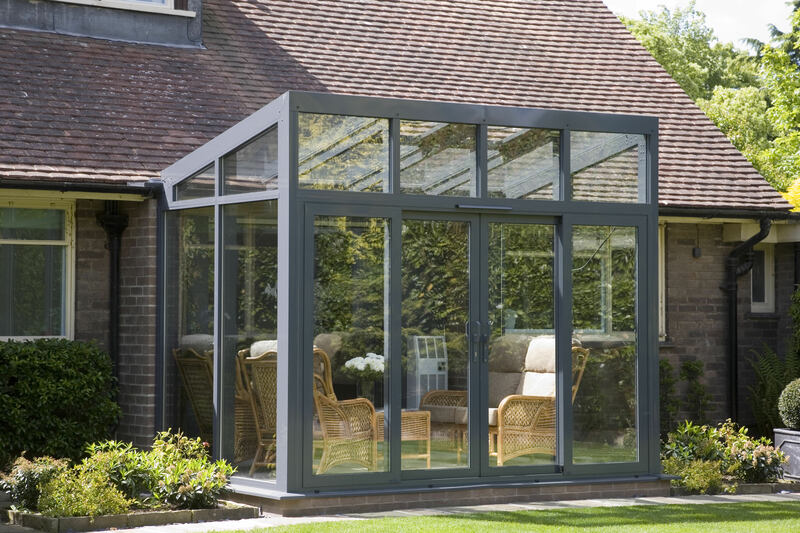 It provides a flexible inside/outside space that you can potentially use (with energy saving glass) all year round. For added security, you can even opt for toughened glass which is 5 times stronger than standard glass. For better temperature control, Solar control glass will help to reduce the amount of heat entering the building. This helps prevent overheating in the Summer. It is quite possible to maintain a comfortable temperature throughout the year thanks to modern glass advancements. Glazing can now have different coatings that will affection the look as well as the performance of the extension. Glass extensions are available in all shapes, sizes and frame materials. For those with an appetite for grandeur, then a fully glazed design can be visually impactful. However, there are many other ways to bring extra light into your home without opting for a fully-glazed addition. Bi-fold doors, rooflights and roof lanterns will all help to illuminate dwellings, bringing light to space that cannot benefit from windows. Side extensions are also another option for making use of redundant spaces. They can be a great link to the next building. They are a great way of adding more volume to a home, without impacting on the size of the garden. A modern gazed extension can be impactful and stunning – if designed well. It is important to consider how your extension will flow from the rest of your house. Also, whether the glazed panels are fixed, slide open or bi-fold, will also have an impact on how the completed glass extension appears. Worried about maintaining a usable, comfortable space? For better temperature control, consider electric blinds, underfloor heating or air conditioning. Blur the boundary between eating inside or alfresco, with a glass kitchen extension. Not only can they turn any cramped kitchen into a sociable, family-friendly space but they are perfect for creating a seamless link between the kitchen and outdoors. Imagine having a seamless view from your kitchen doors, straight through to a water feature in the garden. A glazed extension will make your garden feel a part of the kitchen. A modern glazed extension will complement an open plan kitchen, giving you a multifunctional, minimalist space where you can move easily between areas. Modern, high-tech but also inviting. A glass kitchen extension offers the perfect combination of practicality, quality and price. Find out more about the cost of a kitchen extension here. If your property has good outside views, then floor-to-ceiling glass is a great way of bringing external elements into play. 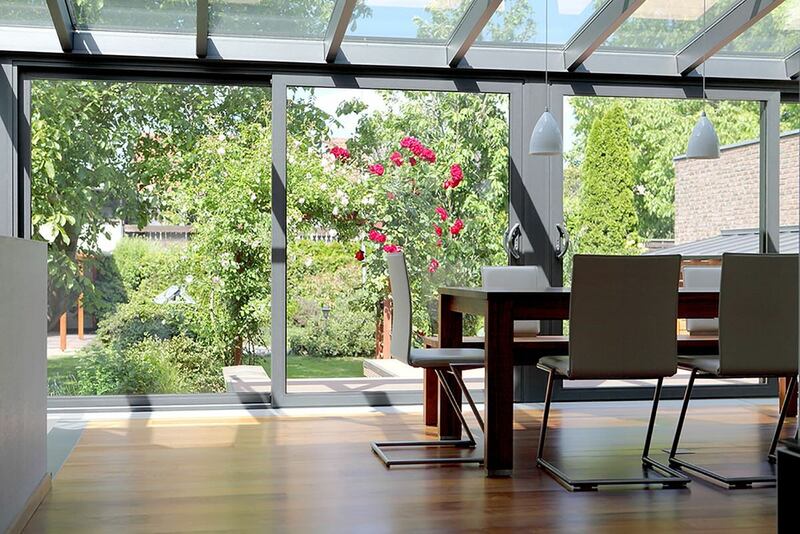 A modern glazed extension will give you a beautiful, contemporary room that gives you unlimited access to your garden. To achieve the best extension, you need to choose the best people. 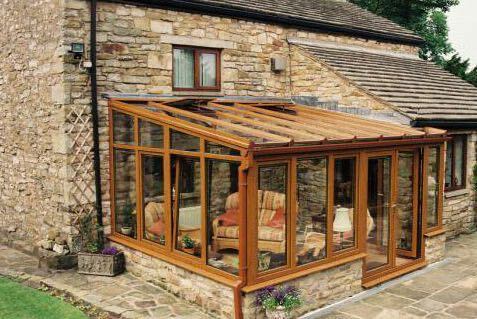 Create a free online quote for your new glass extension or alternatively, contact one of our experts today. Conservatory Village have been supplying and installing beautiful windows, doors, conservatories and glazed extensions for many years throughout Dorset, Hampshire and surrounding areas. What makes Conservatory Village unique is our showrooms. You can experience real, life size conservatories and sit in style until you find the perfect feel for your home. Our showrooms are just a short journey from Bournemouth, Ringwood, Southampton, Romsey and the surrounding areas. Get an instant online double glazing quote for our full range of products including uPVC windows, doors, composite doors, aluminium bifolding doors, conservatories, orangeries, conservatory roofs, lantern roofs and glazed extensions. We install throughout Southampton, Ringwood, Romsey, Bournemouth, Poole, Sandbanks, Dorset and Hampshire.